Do you often feel lonely and sad? Do you long for romance and are willing to do whatever it takes to meet that special person? Speaking another language could revolutionize your love life! So, why wait? Learning how to say ‘love’ in Hebrew could be just what you need to find it. Or perhaps you were lucky, and have found your Hebrew partner already. Fantastic! Yet, a cross-cultural relationship comes with unique challenges. Learning how to speak your lover’s language will greatly improve your communication and enhance the relationship. 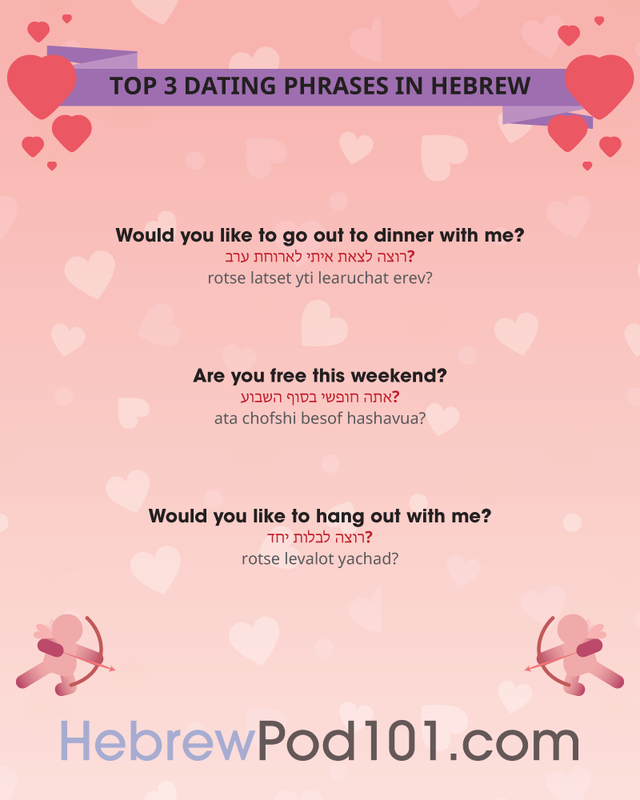 At HebrewPod101, our team will teach you all the words, quotes and phrases you need to woo your Hebrew lover with excellence! Our tutors provide personal assistance, with plenty of extra material available to make Hebrew dating easy for you. Will Falling in Love Help You Learn Hebrew Faster? So, you have met your Hebrew love interest. Congratulations! Who knows where this could take you…?! However, the two of you have just met and you’re not ready to say the Hebrew word for love just yet. Great, it is better to get to know him/her first. 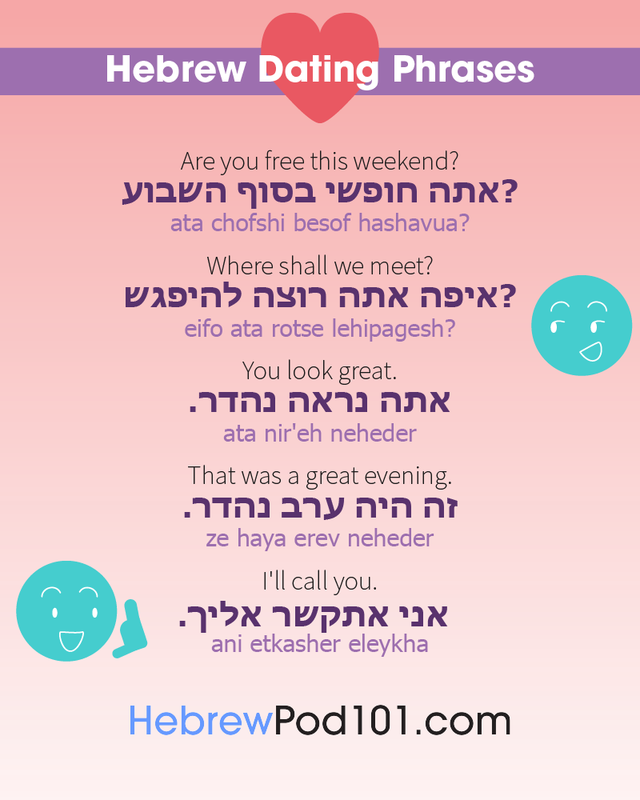 Wow your prospective love by using these Hebrew date phrases to set up a spectacular first date. רוצה לצאת איתי לארוחת ערב? rotse latset yti learuchat erev? The important question! In most cultures, this phrase indicates: ‘I’m romantically interested in you’. Flirting in Hebrew is no different, so don’t take your date to Mcdonald’s! באיזו שעה אתה רוצה להפגש מחר? be’eizo sha’a ata rotse lehipagesh machar? מה אתה חושב על המקום הזה? ma ata choshev al hamakom haze? This another good conversation starter. Show off your Hebrew language skills! מתי אני רואה אותך שוב? matai ani roah otkha shuv? You learned all the Hebrew phrases to make a date - congratulations! Now you have to decide where to meet, which can be tricky. Discuss these options with your lover to gauge whether you like the same things. 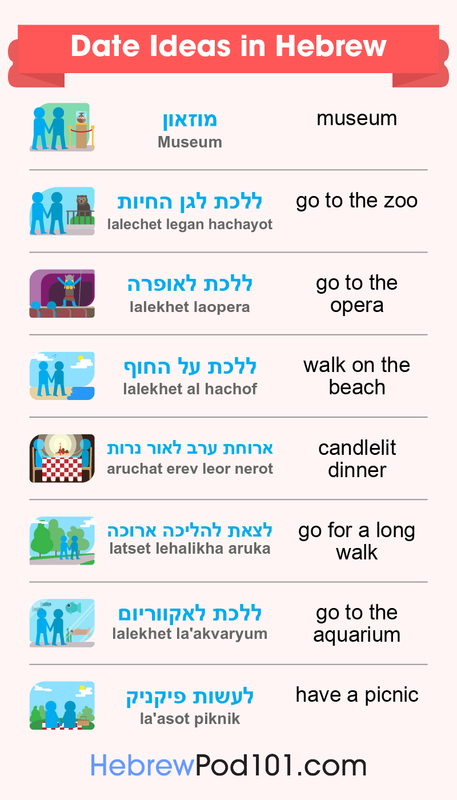 Check out romantic date ideas in Hebrew below! Expressing your feelings honestly is very important in any relationship all year round. Yet, on Valentine’s Day you really want to shine. Impress your lover this Valentine’s with your excellent vocabulary, and make his/her day! We teach you, in fun, effective ways, the meanings of the words and how to pronounce them. 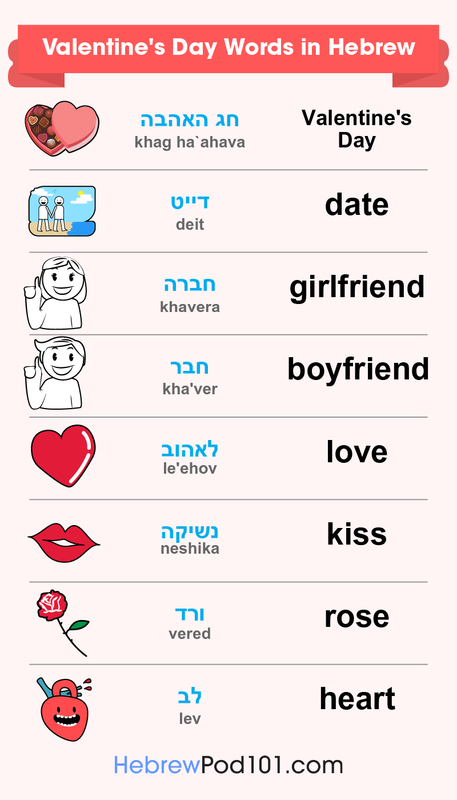 You can also copy the characters and learn how to write ‘I love you’ in Hebrew - think how impressed your date will be! So, you now have the basic Valentine’s Day vocabulary under your belt. Well done! But, do you know how to say ‘I love you’ in Hebrew yet? Or perhaps you are still only friends. So, do you know how to say ‘I like you’ or ‘I have a crush on you’ in Hebrew? No? Don’t worry, here are all the love phrases you need to bowl over your Hebrew love on this special day! Saying ‘I love you’ in Hebrew carries the same weight as in all languages. Use this only if you’re sure and sincere about your feelings for your partner/friend. אתה כל כך חשוב לי. ata kol kakh khashuv li. התהיה בן זוגי בחג האהבה? ha`tihiye ben zugi be`khag ha`ahava? If you don’t know how to say ‘You’re pretty’ in Hebrew, this is a good substitute, gentlemen! אני חושב עליך כיותר מידידה. ani khoshev alaikh ke`yoter miydida. Say this if you are not yet sure that your romantic feelings are reciprocated. It is also a safe go-to if you’re unsure about the Hebrew dating culture. מאה לבבות יהיו מעט מדי כדי להכיל את כל האהבה שלי אלייך. mea levavot ihiyu meat midai kdei lehakhil et kol ha`ahava sheli elaikh. אהבה היא פשוט אהבה. היא אף פעם לא מוסברת. ahava hi pashut ahava. hi af pa-am lo musberet. 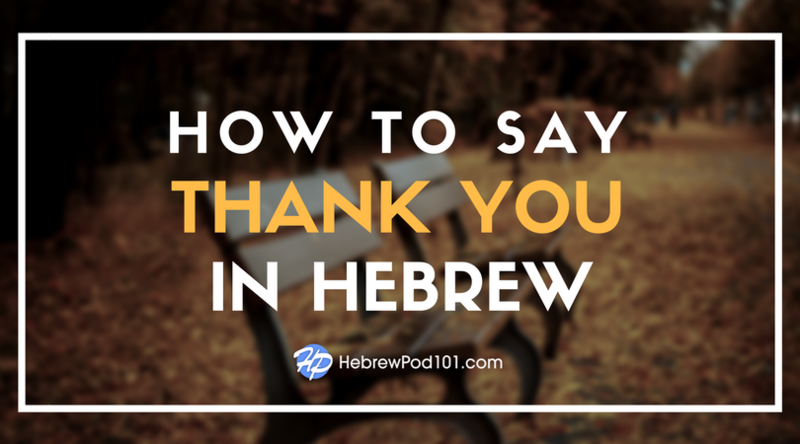 Ladies, this phrase lets your Hebrew love know how much you appreciate his looks! Don’t be shy to use it; men like compliments too. את גורמת לי לרצות להיות אדם טוב יותר. at goremet li lirtsot lihiyot adam tov yoter. Gentlemen, don’t claim this phrase as your own! It hails from the movie ‘As Good as it Gets’, but it is sure to make your Hebrew girlfriend feel very special. Let her know that she inspires you! אתה הקרן אור שלי, האהבה שלי. ata ha`keren or sheli, ha`ahava sheli. מילים לא יכולות לתאר את האהבה שלי אלייך. milim lo yekholot letaer et ha`ahava sheli elekha. אם חשבת על מישהו בזמן שקראת את זה, אתה ללא ספק מאוהב. eem khashavta al mishehi bizman she`karata et ze, ata lelo safek meohav. You’re a love champ! You and your Hebrew lover are getting along fantastically, your dates are awesome, your Valentine’s Day together was spectacular, and you’re very much in love. Good for you! 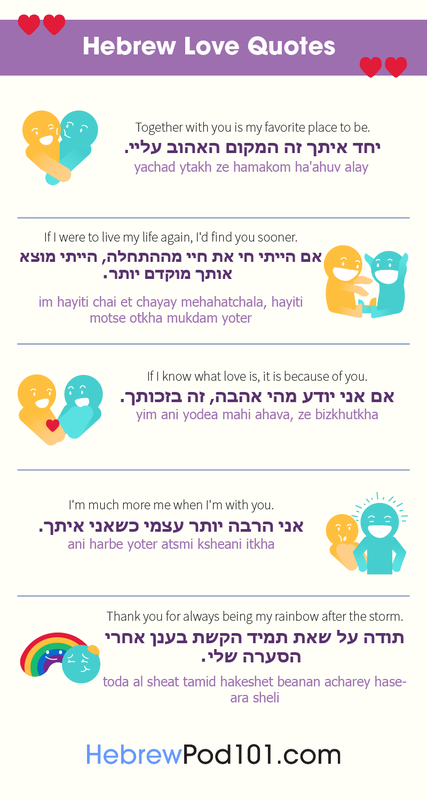 Here are some beautiful phrases of endearment in Hebrew that will remind him/her who is in your thoughts all the time. Wow. Your Hebrew lover is indeed the love of your life - congratulations! And may only happiness follow the two of you! In most traditions, the man asks the woman to marry; this is also the Hebrew custom. Here are a few sincere and romantic lines that will help you to ask your lady-love for her hand in marriage. זה לא אתה. זה אני. ze lo ata. ze ani. As long as you mean it, this can be a kind thing to say. It means that there’s nothing wrong with your Hebrew lover as a person, but that you need something different from a relationship. אני פשוט לא מוכן למערכת יחסים מהסוג הזה. ani pashut lo mukhan le`ma-arekhet yakhasim meha`sug haze. 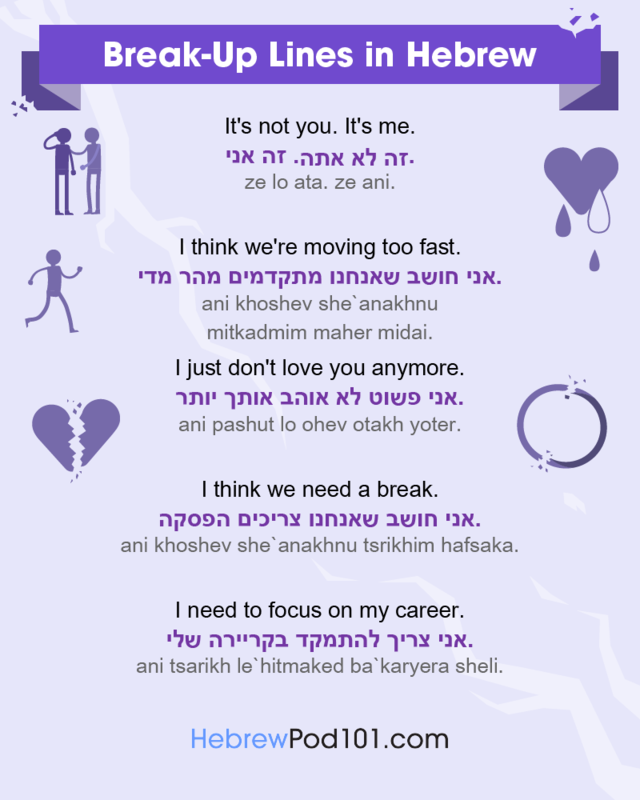 If the relationship was very intense, and you have sent many ‘i love u’ texts in Hebrew, this would not be a good breakup line. Feelings need to calm down before you can be friends, if ever. If the relationship has not really developed yet, a friendship would be possible. אני חושב שאנחנו צריכים הפסקה. ani khoshev she`anakhnu tsrikhim hafsaka. אנחנו צריכים להתחיל לצאת עם אנשים אחרים. anakhnu tsrikhim lehatkhil latset eem anashim akherim. אני צריך את החופש שלי. ani tsarikh et ha`khofesh sheli. אני חושב שאנחנו מתקדמים מהר מדי. ani khoshev she`anakhnu mitkadmim maher midai. אני צריך להתמקד בקריירה שלי. ani tsarikh le`hitmaked ba`karyera sheli. אני לא מספיק טוב בשבילך. ani lo maspik tov bishvilekh. אני פשוט לא אוהב אותך יותר. ani pashut lo ohev otakh yoter. 8. Will Falling in Love help you Learn Hebrew faster? Most people will agree that the above statement is a no-brainer - of course it will! Your body will be flooded with feel-good hormones, which are superb motivators for anything. HebrewPod101 is one of the best portals to help help make this a reality, so don’t hesitate to enroll now! Let’s quickly look at the reasons why falling in love will speed up your learning of the Hebrew language. 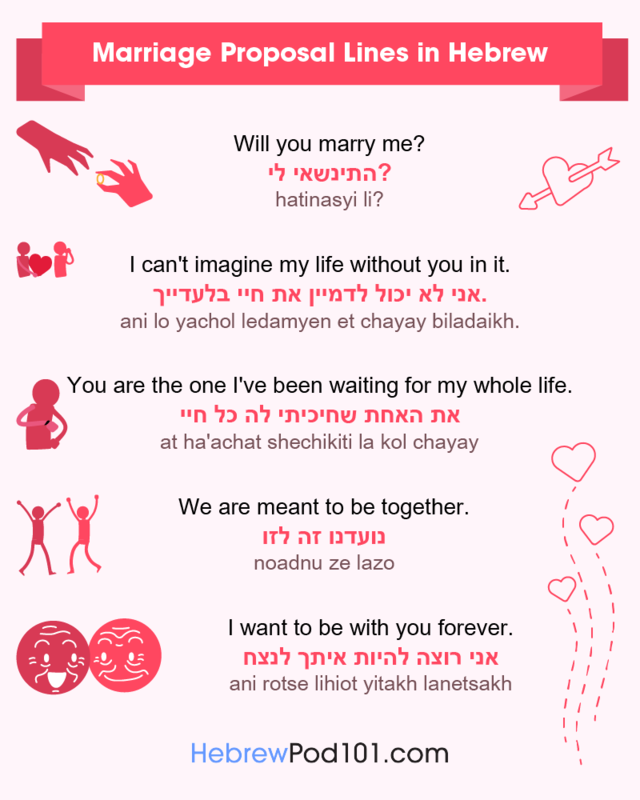 Three Reasons Why Having a Lover will Help you Learn Hebrew Faster! 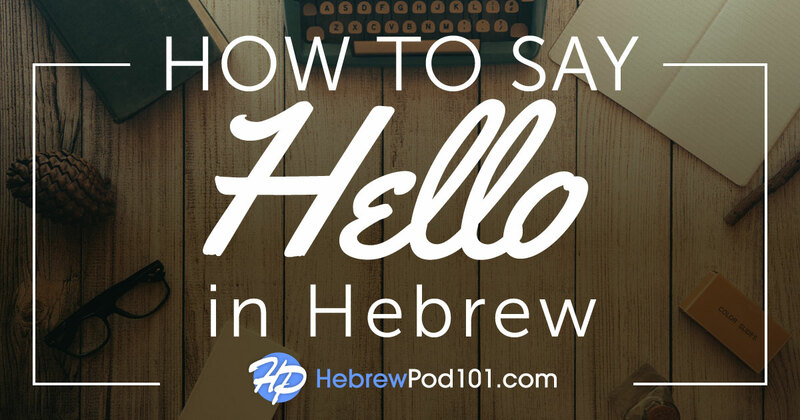 HebrewPod101 uses immersive methods and tools to teach you Hebrew, but having a relationship with a native speaker will be a very valuable addition to your learning experience! You will gain exposure to their world, realtime and vividly, which will make the language come alive even more for you. The experience is likely to expand your world-view, which should motivate you to learn Hebrew even faster. Nothing beats continuous practice when learning a new language. Your partner will probably be very willing to assist you in this, as your enhanced Hebrew language skills will enhance the relationship. Communication is, after all, one of the most important pillars of a good partnership. Also, you will get to impress your lover with the knowledge gained through your studies - a win/win situation! 3- A supportive Hebrew lover is likely to make a gentle, patient teacher and study aid! With his/her heart filled with love and goodwill for you, your Hebrew partner is likely to patiently and gently correct your mistakes when you speak. This goes not only for grammar, but also for accent and meaning. With his/her help, you could sound like a native in no time! Falling in love with a man or woman speaking Hebrew is an opportunity for both of you to learn a new language! For this reason, every lesson, transcript, vocabulary list, and resource at HebrewPod101 is translated into both English and Hebrew. So, while your partner can help you learn Hebrew faster, you can potentially also help him/her learn and master English! At HebrewPod101, our focus is to help our students learn practical vocabulary and phrases used by everyday people in Israel. This means that, from your very first lesson, you can apply what you learn immediately! So, when your Hebrew partner wants to go out to a restaurant, play Pokemon Go, or attend just about any social function, you have the vocabulary and phrases necessary to have a great time! 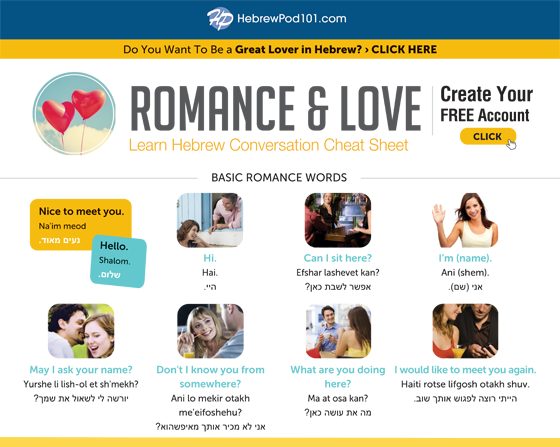 You now have access to HebrewPod101’s specially-developed sections and tools to teach you love words, phrases, and cultural insights to help you find and attract your Hebrew soul mate. A personal tutor will assist you to master these brilliantly - remember to invite him/her to your wedding!